It’s not a surprised I use Twitter more often now to promote my blog and YouTube channel. I’m usually on there to just find something to read or have something short to get off my chest rather than posting it on my blog with under 140 characters. For a awhile when I started my blog, I wanted to be able to spread my message out there in the simplest form. Mainstream or some way to broadcast to the world, “I wrote something, might be nice to give it a read.” I started using Twitter as a media prerequisite to learn about the world and the culture I live in, over time the account went into disuse until I started my blog. First impressions, Twitter wasn’t the best place for a 19 year old. I was on it because my teacher wanted me to be on it so classroom censorship was a tough deal breaker when you have something to say but your account is restricted for media studies only. The turn around when I started this blog a few years ago a way to document my thoughts and activities. As I began to grew a skin around blogging and microblogging, I decided to use an application to be a hub for all my Twitter needs. At the time, I just read up on applications and reviews; most of it in jargon. So rather than just reading a review for the pick, I just observed what everyone was using. Most of the time, it was TweetDeck and HootSuite. For the past couple years, I’ve used TweetDeck on the basis of popularity. It was most commonly used when I was lurking at hashtag threads. When I first got it on Chrome, the interface was simple to master. One simple login screen later, the application went to work by sending me feeds from my own Twitter. Soon after, found the Search button to find other hastags to follow and after that was able to organize to what I wanted to see and not see certain posts. But that’s just one camp out of many to simplify the experience. The other large one I seen and heard about was HootSuite. Only largely came to me from large app review sites and users from organizations. I was really hesitant at first to ever try it. Today, let hesitation be damned! Setting into a new application isn’t always easy if you’re like me, why move on to something else when one works perfectly? 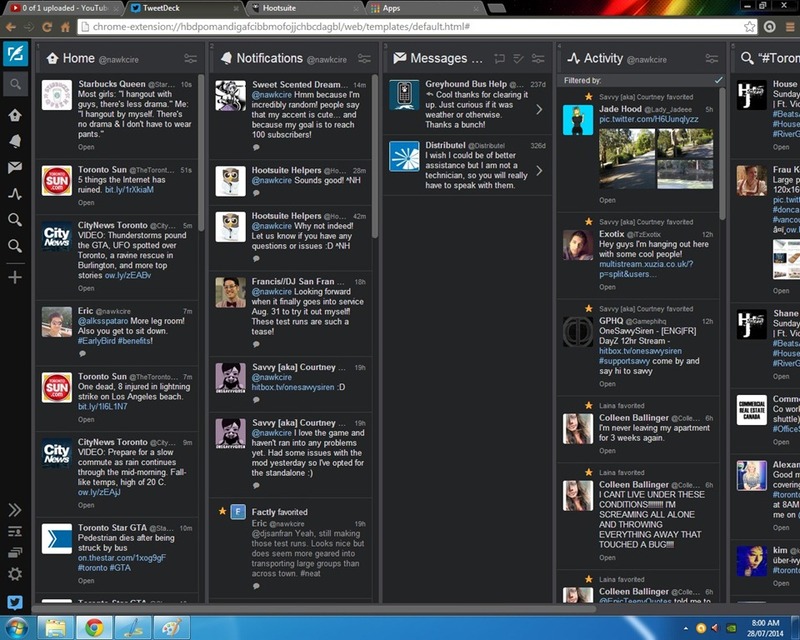 After creating an account through HootSuite, I was greeted with a stark dashboard similar to the TweetDeck app. Along with an approximate sidebar for your options. So how do they fare against each other? After spending a few hours on HootSuite, the similarities begin to fade away. Both platforms offer multi-account support, so you can monitor each Twitter profile simultaneously. Each can create tabs based on criteria such as retweets, favourites, and hashtags you wanted pinned as a tab for easy reference. TweetDeck and HootSuite provide a simplified interface to ensure ease of use, so you know where to go and how to do certain Twitter-y tasks. Unfortunately this is where TweetDeck ends it’s list of goodies. HootSuite offers more than just connectivity to Twitter. It provides a way to be connected to other blogging and social media websites like LinkedIn, WordPress, Facebook and mixi (Hell if I know what is mixi). Along with account aggregation, it has an array of enterprising features such Assignments to help business consolidate their media efforts. As a Pro and Enterprise user, you have access to team organizations to help with assignments. With organization, you would want to see the team’s or your brand’s performance in media; so they have analytics to help form a report on your media involvement through all your accounts or just particulars. Along with it’s organizational faire; it boosts a range of in-app applications such as a YouTube app to view and share through your HootSuite, which most apps are trying to advertise the same view and share feature if not trying to enhance the in-app experience. As a Personal user, I found the program fairly restrictive. Most of the features your listed as Pro feature which required a $8.99 (assuming US currency) per month payment for use. The only things I can really necessarily do is add apps within an app and just view counters of my tweets and followings with analytics. As a personal user, the only redeeming quality is a list of followers and a list of people I followed; which is easily accessible but really unnecessary at times. Like this feature already available on TweetDeck and on Twitter itself, it’s analytics is par if not worst to the online solution already provided by Twitter. I’m a free user on both, but getting additional data from Twitter for free. Though if I was a business, I would agree HootSuite might contain some insight through it’s own analytics but would not necessarily change my behaviour within social media. The auto-scheduler is a nifty touch if you want to send out tweets at a particular time. However this feature is best removed to prevent people with spam accounts from filling threads with their wares. Unlike Tweetdeck, it feels more geared towards businesses than it is for individual users. With it’s suite of analytics and in-depth monitoring, it’s a improbable choice for a single user like me. What I found interesting is the load times and the refresh rates. 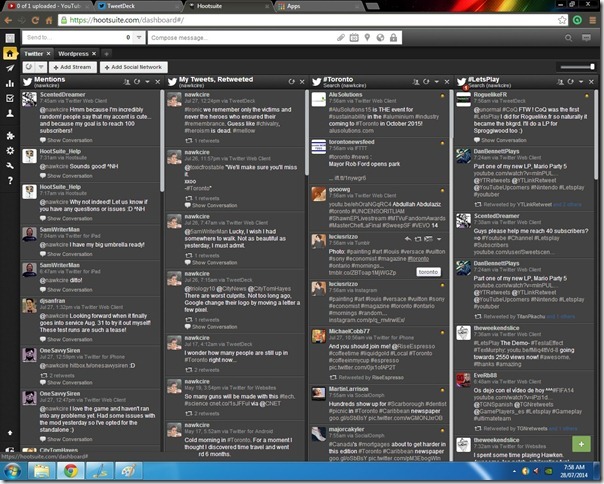 Upon loading up each application, I found TweetDeck to be much faster. Though if you have a speedy connection, you won’t feel it. As a person who uploads video to YouTube, it’s noticeable. I can only speculate what is going behind the scenes, but this slowdown makes it very regrettable since it feels not optimized for lower connection speeds. On HootSuite, you can set refresh rates to as close to 2 minutes for each tab within the application. On TweetDeck, you can set it to almost real time in a margin of a few seconds if you have a slow connection. While TweetDeck can update in the background, Hootsuite seems to stop updating when you’re not in the Chrome browser tab. Along with update angst, the way it personally handles hashtags does make it easier to read since it gives you a brief amount of time before the dashboard tab refreshes. Good thing if you are watching a keyword or tag with a lot of frequent users. Each application has features gear towards a niche user. Enterprising and business prefer to see things by the numbers while your average Jane and Joe want to just post and share. As a personal user with very little social outreach, it would be preferable to stick with TweetDeck by Twitter for it’s simplicity. Simple doesn’t always mean better, simple means in this case I get what I need and I don’t really need it to be any better. If I was a social media specialist or a community manager for a large organization with multiple accounts, I would say HootSuite is the way to go to provide the means of easy consolidation; but would not jump on board too quickly on analytics. Overall experience for both, restrictive on HootSuite where features are blocked and load times are slower when connection is slow. However it does provide a sense of additional control through analytics and aggregation. Where are TweetDeck is simplistic with little to no load times. However remains to be seen if it can handle business. Until next time, follow me on Twitter?